Teneurins are transmembrane proteins. The name refers to “ten-a” (from “tenascin-like protein, accessory”) and “neurons”, the primary site of teneurin expression. Teneurins are highly conserved between Drosophila, C. elegans and vertebrates. In each species they are expressed by a subset of neurons as well as at sites of pattern formation and morphogenesis. In Drosophila, a teneurin known as ten-m or Odz is a pair-rule gene, and its expression is required for normal development. The knockdown of teneurin (ten-1) expression in C. elegans with RNAi leads to abnormal neuronal pathfinding and abnormal development of the gonads. Teneurins are a unique family of transmembrane proteins conserved from C. elegans and D. melanogaster to mammals. In vertebrates there are four paralogs (teneurin-1 to -4), all of which are expressed prominently in the developing central nervous system. So why mention these proteins? Your body depends on a continuously moving stream of blood in order to stay alive. Why? Because it is the blood which carries the oxygen needed to fuel the electron transport chain in the mitochondria of all your cells. The continuous movement of the blood, thanks to the heart, coupled with the continuous supply of oxygen to the blood, thanks to the lungs, means all of the body cells have the ability to continuously generate ATP by their mitochondria. And that ATP is needed to run the variety of molecular machines inside the cells. But the liquid portion of the blood, the plasma, can only dissolve and carry about 3% of the body’s oxygen demand. The other 97% of the oxygen must be carried by the blood transport protein, hemoglobin. Hemoglobin is composed of four amino acid chains known as globin, each one with a red pigment molecule known as heme embedded inside. The heme binds on ionized form of iron, which in turn is where the oxygen binds. Every red blood cell is packed with hemoglobin, thus oxygen. What this all means is that your large, complex, multicellular body exists because of the globin protein. It is the globin, with its ability to bind, hold, and release oxygen that facilitates its existence. We have seen that prestin is a motor protein found in the outer hair cells of the inner ear of the mammalian cochlea. It vastly enhances auditory sensitivity by converting the energy from an ion gradient to force such that if you eliminate this protein in mice, there is a greater than 100-fold loss in auditory sensitivity. Echolocation requires exceptionally high frequency hearing and, though echolocating whales and bats generate their calls differently, their cochleae show multiple convergent anatomical features . In particular, the cochlear OHCs in both taxa are shorter and stiffer than in other mammals , and this inferred adaptation for processing ultrasound is supported by audiograms that reveal correspondingly higher frequency thresholds . (Yang Liu, James A. Cotton, Bin Shen, Xiuqun Han, Stephen J. Rossiter and Shuyi Zhang. 2009. Convergent sequence evolution between echolocating bats and dolphins. Current Biology Vol 20 No 2). Prestin would thus appear to be a good candidate for something I describe in The Design Matrix. As always, I am pressed for time, so let me introduce you to the protein which appears to have helped guide the independent appearance of echolocation – prestin – with a few cut-and-pastes. A protein is a chain of amino acids that folds into a particular three dimensional conformation. A fold is a particular conformation. What science has discovered is that even though amino acid sequence variability is immense (for a protein of 100 amino acids there are 20^100 possible combinations, since there are 20 different amino acids), there are only about 1000 or so shapes/folds that are employed by life. 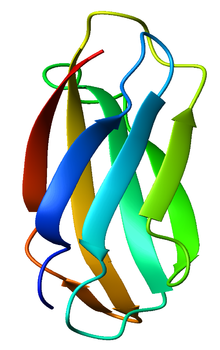 You can think of a fold as a region where the amino acid chain is arranged into a scaffold. Function is tied to the scaffold when it is decorated with an active site (which is usually some cleft or groove on the protein’s surface that binds a substrate and converts it to a product), and/or with other binding sites. The immunoglobulin fold is a particular scaffold arrangement that is used to make antibodies (this scaffold is also found in many other proteins). So I would like to pose a question that, as far as I have been able to determine, has never been asked. This all raises some interesting questions. For example, without proteins, and their manufacturing process, what becomes of the blind watchmaker? Without proteins, and the latent functions contained within, might not the blind watchmaker exist as the impotent, crippled, blind watchmaker with no one to notice its existence? If so, how much credit does the blind watchmaker really deserve? The vast and immense Tree of Life is a protein-dependent output. Point to some evidence of evolution and I’ll point to the proteins that underlie it. Without proteins, would there be a Tree of Life 3.5 billion years after the RNA world took root? How do we know? If we believe so, would the Tree be as immense and vast as it is today? A life form composed of nucleic acids, carbohydrates, and lipids would suffice for the purposes of the blind watchmaker. But could the blind watchmaker turn this material into something that is analogous to an Ash tree filled with squirrels, beetles, and birds?